Thought leadership can be vital to a successful content marketing strategy but how do you create it and why is it useful? Many marketers face the challenge of creating amazing thought leadership content, and although it’s become a corporate buzzword in recent years, it’s still a difficult task. Simply put, thought leadership is a tactic used in content marketing where experts answer the questions of their readership in a deep and meaningful way, in a form they most like to consume. It’s not enough to create a single article and expect to become a thought leader. Thought leadership is built through experience and credibility over a prolonged period of time. More than simply answering questions, thought leadership involves the ability to predict trends, provide opinions on current issues within your industry and give a unique perspective. This isn’t necessarily dictated by you, but rather what your audience considers to be important. Why is thought leadership important? Thought leadership has become a hot topic in the increasingly competitive world of content marketing. Establishing a name or a brand within an industry has never been more important, and thought leadership has become the front runner in distinguishing brands against the competition. Investing in thought leadership not only allows you to ‘own’ your industry, but enables you to drive your industry forward by redefining and evolving the current marketplaces, a sentiment described by Paul Suchman, global CMO at CBRE. Not only does thought leadership distinguish your brand from the competition, it enables you to build trust with your readership and become a go-to source for information. This relationship with your target audience is further strengthened by a strong marketing voice that can be established through effective thought leadership, creating a continually-improving marketing cycle. 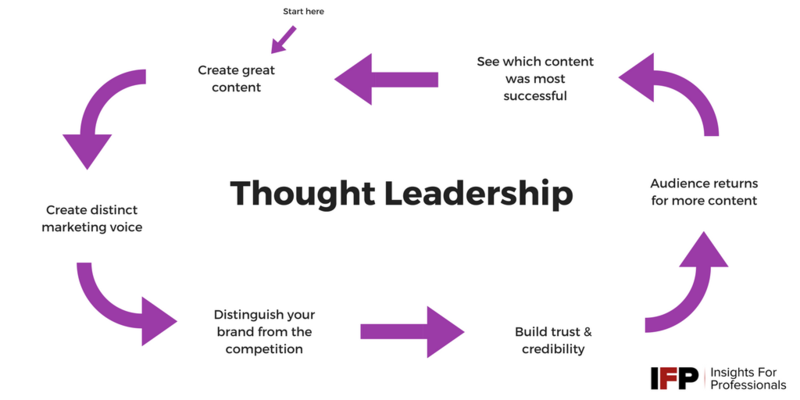 In order to become a thought leader, you need to create great content. We’ve already established that there’s more than meets the eye when it comes to thought leadership, and the same goes for great content. It’s not just about churning out continuous content. To be a true thought leader you need to determine how to set your brand apart from the competition with the content you create. Ultimately, this should be your number one goal. In an article for Huffpost Roger Bryan discusses the three rules for creating good quality content; informative, interesting, relevant. This translates into being useful. Content that is useful will provide your readers with more value and will begin your thought leadership journey. By creating content that helps your customers/readers to achieve what they want, you’re not only making their lives easier but also showing them that you know what you’re talking about. In a content marketing survey conducted by IFP in May 2017, 65% of respondents said they read content in order to find a solution, whereas only 4% of those surveyed did so because they had a spare five minutes. This demonstrates the importance of ensuring that content is useful, concise and valuable. You should include emotion and storytelling in all aspects of your content marketing in order to ensure it’s memorable. People react strongly to emotion and this can have a greater overall impact on how they view your brand. Industrial giant GE balances experiential, emotional content marketing on social channels for branding and attracting talent, with detailed thought leadership from engineers for their longform written content on their microsites. They are even pushing the boundaries of interactive content with content hubs like World in Motion. Relying on the experience of the reader means that if you can include storytelling or evoke emotion in your content, you are making a stronger connection with your reader whilst establishing yourself as a thought leader. All content you produce needs to be based upon a solid industry knowledge. This is a must for thought leadership beginners. Branching out into unknown industries will only end in disaster. Stick to what you know and the rest will follow. It’s important to be aware of the current events in the world. With the political turmoil throughout 2016 of the US election and the UK’s decision to leave the EU, certain topics of conversation are going to have a greater influence on your audience than others. Demonstrating your up to date with the current events and trends will keep you at the forefront of your industry. In order to write useful content for your readers, you must first understand their problems. Creating content that doesn’t help them solve their pain points is going to of no use, and won’t establish you as a thought leader. It’s not enough to have a rudimentary understanding, you need to really dig deep to get to the heart of the issue. The problems that you solve need to be real. This goes hand-in-hand with a deep understanding. Just as the problems need to be real, so do the solutions. It’s no use providing a solution that doesn’t actually work. Copying your competitors will only go so far and won’t establish you at the forefront of your industry. See what they’re doing and then think about how you can replicate it but better, or different. Taking their ideas and reworking them into your own brand message will help you to catch up, but only the unique insight your specialists can offer will let you overtake them as the leading brand. Make sure that your titles are accurate and relevant. A great title is what will entice readers to click and actually read the rest of the article, but don’t get carried away with clickbait titles that don’t accurately reflect the content as this will only discredit your brand and break the thought leadership cycle you’re trying to create. Crafting titles is a delicate balance between telling the reader what’s coming next, but not giving so much away that they don’t need to read the article. Like movie trailers, it can sometimes be difficult to strike the balance without giving away all the best bits. However, this is an important tip to remember in order to avoid discrediting your brand. Complicated jargon simply alienates the reader. If what you’ve said in 30 words could have been told in 5, then you’re likely to bore your reader. With so much online content scrabbling for our attention, it’s more important than ever that you’re accurate, to the point and jargon free. If you need to use numbers, statistics or any kind of data in your content, then tell a story with it. Numbers hold very little appeal to many people and lists of data aren’t interesting. If you can craft a story around the numbers, not only will you hold your readers attention but you will also be able to get the message across. Whenever you create a piece of content, it’s important that you assess its shareability. If it’s not worth sharing, then it’s not worth reading, and if that really is the case, then it’s not worth creating and will only hold you back.